The 3R’s have Reduce and Reuse before Recycling because they stop waste at the source. Rethink your waste by reducing the items you want and giving reuse an opportunity for items you don’t. There are many simple steps that you can take to Reduce what you and your family contribute to the landfill. Do what works for you, start with one thing, and get creative! Reduce the amount of packaging you buy, reuse what you can, and recycle the rest. Look for products without packaging – tools, fresh produce, dry goods. Avoid individually wrapped portions (chips, cheese slices, juice, etc.). Buy in bulk. Sometimes you can take your own plastic or other containers to the store to be filled directly with bulk goods. Opt out of a bag when purchasing one or two items. Choose rechargeable batteries and portable appliances or electronics. Purchase items that are made to last and keep them for a lifetime. Avoid disposable and single use products (razors, pens, silverware, cups, bags, napkins, etc.). Repair your item when possible instead of buying a new one. Fixit Clinic is an all-ages, do-it-together activity where people bring their broken household things and learn how to assess, disassemble, and hopefully repair them instead of sending them to the landfill. Help your neighbors troubleshoot and fix their broken things at the quarterly Santa Fe Fixit Clinics! TIPS for the office or business? Set your printer default to double-sided copies to reduce paper waste by up to 50%. Use e-mail or routing slips when circulating memos or documents. Share newspapers and magazines and then recycle them. Use small stick-on fax headers and omit cover sheets. Purchase recycled paper products such as stationery, scratch pads, business cards, paper towels, toilet paper and facial tissue. Recycle and use recycled printer ink cartridges. Do You Know…How to Reduce Your Toxic Waste? It’s easy and usually less expensive to make your own non-toxic cleaners which are healthier for you and the environment. Make an all-purpose cleaner: 1 gallon hot water, 1/4 cup ammonia, 1/4 cup vinegar & 1 tablespoon baking soda. Safe on most surfaces, rinses off with water. Use hot vinegar instead of paint thinner on brushes. Make up an inexpensive silver polish: 1 quart warm water, 1 tsp. salt, 1 tsp. baking soda, 1 piece aluminum foil. Soak silver for 10/15 minutes, wipe with a soft cloth. Use old toothbrushes and other brushes to clean bathroom tile, shoes, etc. Use baking soda to clean sinks, toilet bowls and showers without harsh chemicals. Also, only a box will be left instead of plastic bottles. Clean windows and mirrors with a simple solution of 3 tablespoons of white vinegar and two cups of warm water in a spray bottle. Apply with newspaper. “Closed loop” recycling is basically a production process in which post-consumer waste is collected, recycled and used to make new products. This process can be as simple as using recycled aluminum to make new cans, or as complicated as weaving reclaimed plastic bottles into polyester for clothing and other products. 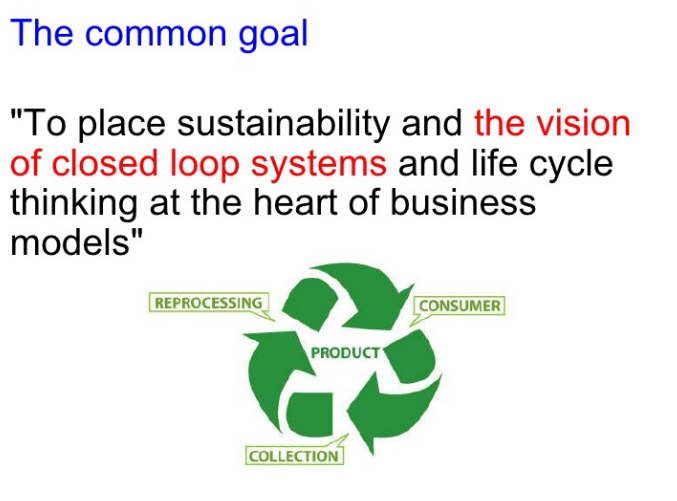 For the closed loop system to function properly, consumers, recyclers and manufacturers must work together to reclaim valuable materials from our waste stream and use them to make new products.